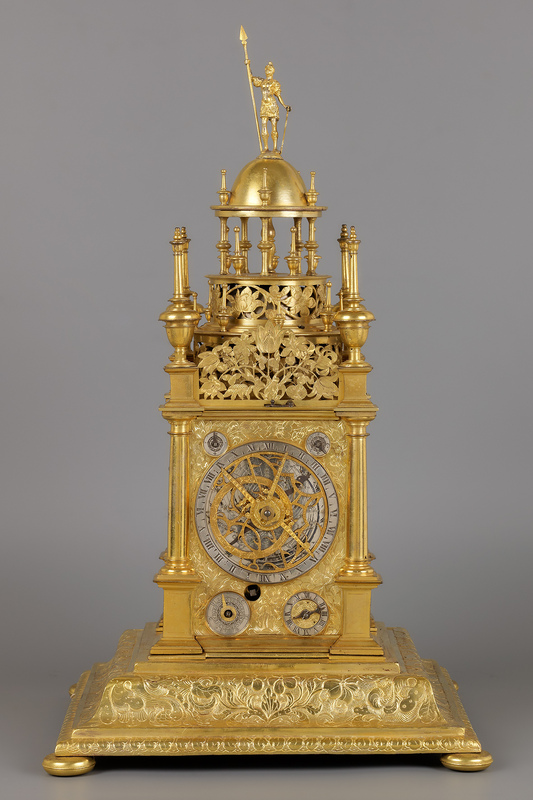 A classic, beautifully proportioned German table clock (tabernacle clock) with astrolabe, made around 1640. The firegilt copper case is covered with engraved floral leaf motifs. On the corners are plain pillars with austere capitals and bases on rectangular pedestals, surmounted by prominent finials on similar, somewhat smaller pedestals. Between these finials are beautiful pierced and engraved frets. 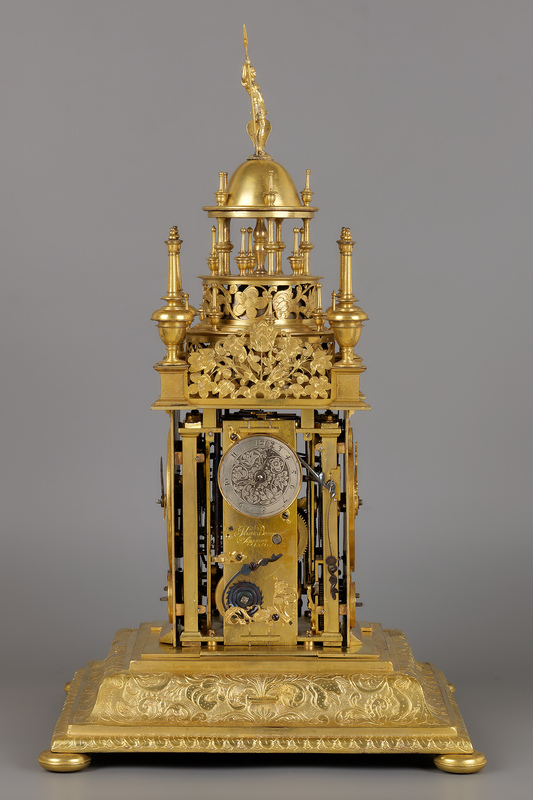 The superstructure on the top plate consists of two levels, both with elegant pierced cylindrical bell chambers; the lower one for the hour bell. There are finial rings on three levels, whilst the whole is surmounted by a dome with a statue of a Roman soldier with spear and shield. 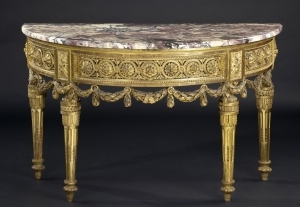 The square moulded base rests on four bun feet and is beautifully engraved and chased. The front shows a large Roman chapter ring (I-XII twice) with astrolabe around an engraved silver background disc, depicting the heavens. There are three engraved firegilt hands: one with a sun emblem, one with a lunar motif and the third unmarked, which forms one part with the sun hand. In addition, there is a blued-steel hand behind these hands, the so-called dragon hand. The solar hand indicates the time of sunrise, whilst the lunar hand shows the time of moonrise. The whole revolves once every nineteen years and shows the sky as we see it above us. In this way the position of the sun in the Zodiac can be observed against the engraved background, as well as the lunar orbit. When the sun or lunar hand coincides with the dragon hand there is a solar or lunar eclipse. The circular middle of the hands has a scale 1-29.5 on which the tail of the lunar hand indicates the age of the moon. The moon phase can be observed in a circular hole in this middle part, which has an engraved aspectarium. In the four corners are secondary chapter rings; top left for selecting either quarter striking (4) or hour striking (12); top right for regulation (1-8); bottom left showing the Dominical Letter (which indicates on which day January 1 falls (e.g. A = Sunday, B = Saturday, etc. ), so that the date of the first Sunday in the year can be ascertained, also in leap years); bottom right for showing the time, the centre having an alarm disc. On the rear side is a chapter ring, on which the time is indicated. From the outside towards the centre there is respectively a quarter and minute ring, a date ring, an hour ring with Roman numerals (I-XII twice), a firegilt hour ring with Arabic numerals (1-24), a wide ring to indicate the length of day and night, and an alarm disc (1-24), the whole surrounded by a reversible semi-annual calendar, on which the saint of the day is indicated. On the left-hand side the position of the hour striking is indicated (1-12), whilst on the opposite side the position of the quarter striking train can be read (1-4). 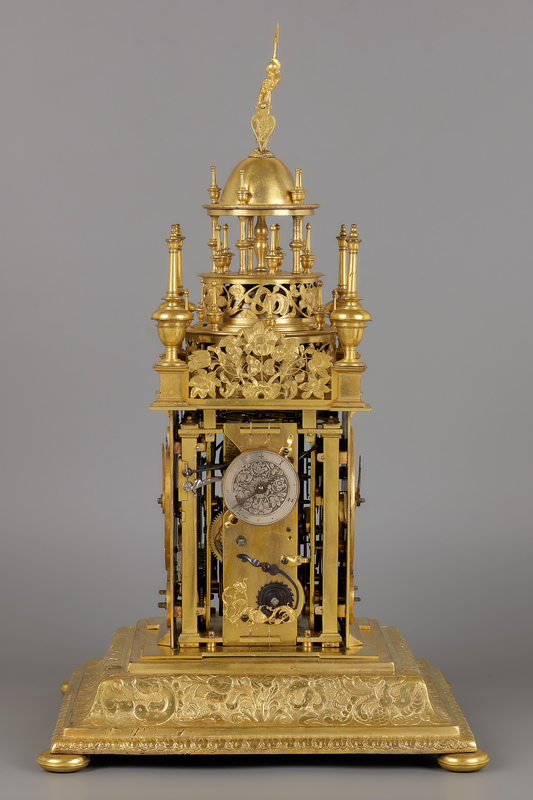 The two-day duration, spring-driven, triple chain-fusee movement is constructed between brass bars, the striking trains being at 90 degrees to the going train. The going train has a vertical verge escapement with balance wheel without hairspring. The hour striking, regulated by a countwheel, indicates the hour on the lower pitched bell, whereas the quarter string, also regulated by a countwheel, indicates the quarter hours on the higher pitched bell. Finally the clock has an alarm. There is a button under the front fret to switch the alarm on or off. It is wound in the middle of the Dominical-Letter ring. 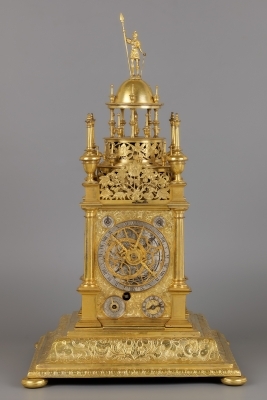 Johannes Benner was active as a clockmaker in Augsburg from around 1620 until 1659. He is believed to be the son of Philipp Jakob Be(r)ner (P.I.B), who was a sundial maker. 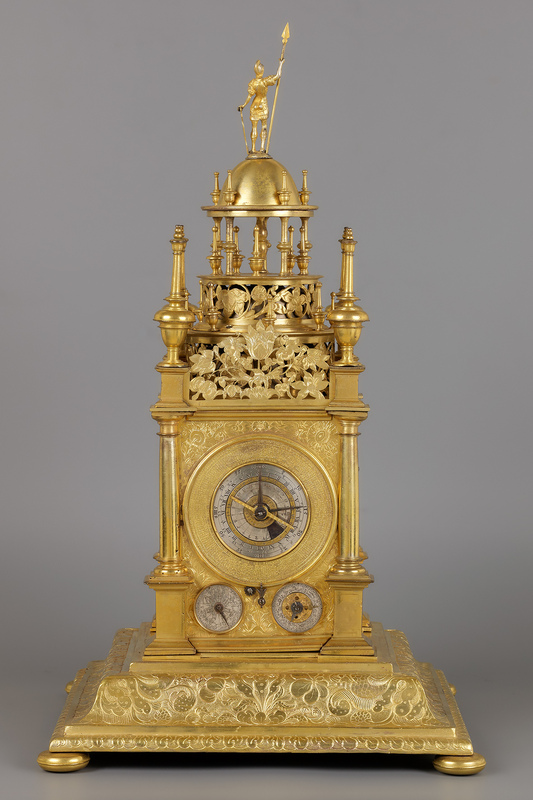 A horizontal table clock by Benner can be found in Peter the Great’s study in the Palace of Peterhof, west of St. Petersburg. 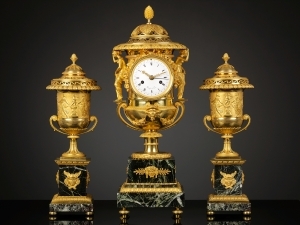 Only a handful of other clocks by Benner are known. 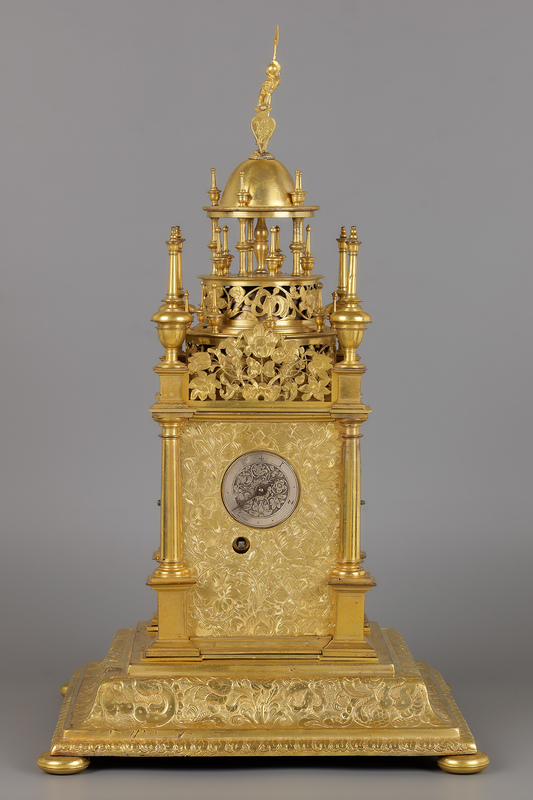 The present clock has all the hallmarks of a ‘masterpiece’, which was required to be made by Augsburg clockmakers to be admitted as a master of the Guild. 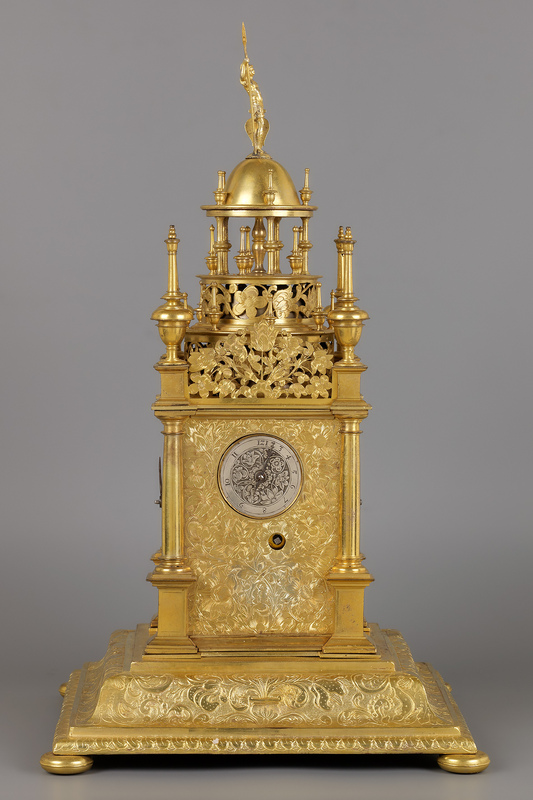 It is an exquisite clock indeed and not unthinkable that Benner was admitted as master to the Guild on the basis of producing this clock.